Walton Homes has announced high levels of interest in its latest Staffordshire development; with one plot already reserved and Early Bird reservations on the remaining properties. 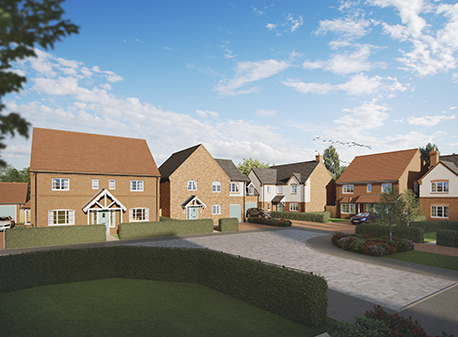 Build is well underway for the seven four-bedroom properties that make up Walton Croft at Walton-on-the-Hill, with the first plot having already been released, and further plots imminent as construction progresses. Amy Summerton, director of the business, said: “We received a fantastic response to our last Stafford development; Redfern Rise at Haughton, with only one plot remaining at the site, so we weren’t surprised to receive so much interest in Walton Croft. “This is an exclusive collection of individually designed, high- specification homes. With seven uniquely different house designs, the development will feature a range of different layouts aimed at different lifestyles and owners, culminating in a fantastic street scene. “Already all seven plots have been held as early Bird reservations, with the first full reservation having been confirmed last month. We expect the majority of these Early Bird reservations to commit to full reservations as plots are released, although interest from other homebuyers has seen a waiting list launched for specific plot interest, should any of those not commit,” she added. The Milford Road development occupies a desirable area and will be built using local materials to ensure that they’re sympathetic to the surrounding buildings. Amy added: “As we discovered when we announced our intention to develop in this area early last year, demand for high-specification homes in Stafford is extremely high, so we’re looking forward to releasing these homes and seeing the response as we do. “We’re currently identifying further sites across the region to site our next developments,” she said. There is no sales office at the Walton Croft site, but information on the development can be requested from Walton Homes’ head office on 01543 412288.